Toads feed on insects and other invertebrates. They're particularly fond of slugs, sow bugs, earwigs, cutworms, and gypsy moths. In fact, nearly 90 per cent of a toad's diet consists of garden pests. In a single growing season, a busy toad can consume more than 10,000 of these uninvited guests. 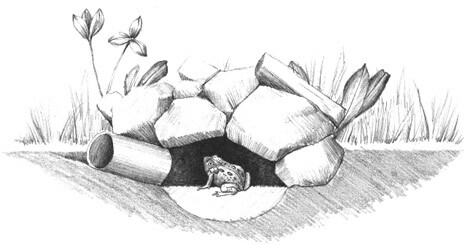 Toads like to hide in cool, dark places during the day and come out to hunt at night. Not surprisingly, they avoid pesticide-ridden, manicured lawns. • Use an old clay pot about 20 cm in diameter. • Make an entrance by gently knocking a semicircular section 8 cm wide x 4 cm high out of the edge of the pot. • Place the pot upside down in a shady spot near a source of water. • Dig a (roughly) square hole about 25 cm x 25 cm in the ground. • Cover the floor of the hole with sand. • Use flat stones to make sides and a ceiling. The resulting chamber should be no more than 20 cm x 20 cm. • Use a 12 cm long section of 7.5 cm diameter pipe as an entrance leading diagonally into the hole. • Shade the opening with a small plant. 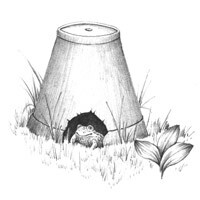 Check the toad hole regularly for signs of damage.